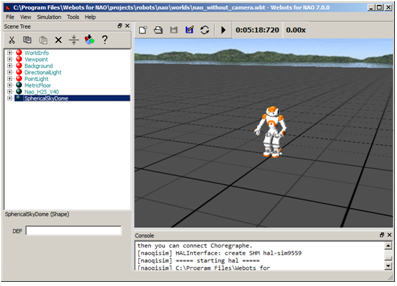 Webots allows you to launch a simulated NAO moving in a virtual world. It offers a safe place to test behaviors before playing them on a real robot. 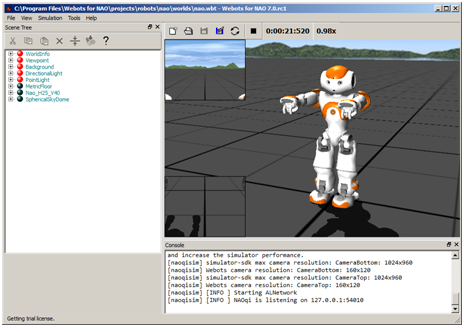 Since Webots 8, a module named nao_qi is available for the owners of a Webots for NAO license. 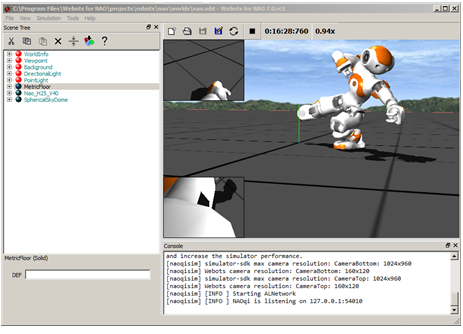 It provides predefined NAO simulations and with their ready-to-use controllers. 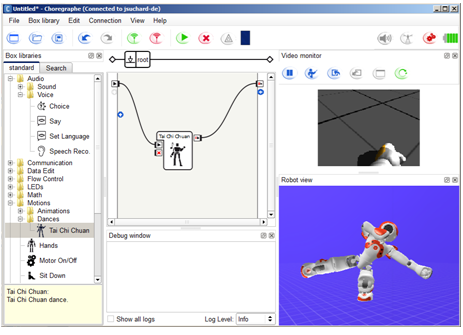 Webots for NAO license owners only have access to a subset of Webots features. They cannot use other robots nor create new robot controllers. You can download the latest release from Aldebaran Community website. For further details, see: Retrieving software. Uninstall completely any old version of Webots. Launch the installer then follow the step-by-step instructions. Choose Connection > Connect to or click the Connect to button. Select your simulated robot (the name should include the name of your computer). check what the virtual robot is seeing in the Video monitor panel. 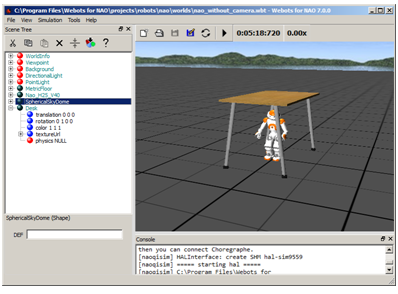 Make sure you have launched a simulated robot and have connected Choregraphe to it. 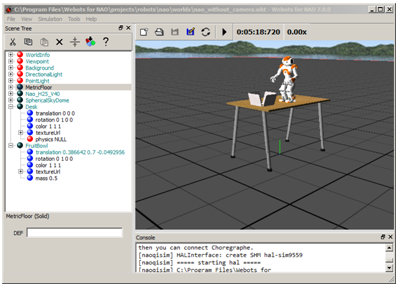 Connecting Choregraphe to the simulated robot. In Choregraphe, create a behavior. For example, test the Tai Chi Chuan box. Make sure the Stiffness is on or click the Wake Up button. Click the Play button and follow the behavior both in Choregraphe and in Webots. Try to modify your point of view. For further details, see: How do I navigate in 3D world? in the Help menu. 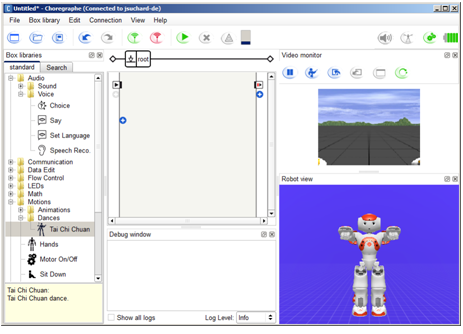 In Webots, double-click the robot. Choose one of the tabs and select the data you want to monitor. Make sure the simulation is stopped. Otherwise, choose, Simulation > Stop then File > Revert World. In the Scene Tree, select the last node. Let’s play with objects in order to learn how to move them. Otherwise, choose, Simulation > Stop. Try to put the fruit bowl on the table. 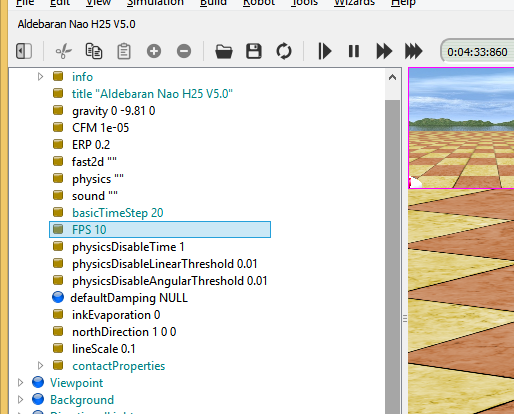 For further details, see: How do I move an object? in the Help menu. 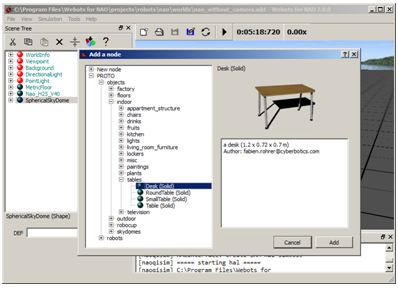 Read the Section 8.2 Using the NAO robot of the Webots user guide to learn more about managing one or several NAOs using Webots. Make sure the simulation is not stopped in Webots. Choose View > Restore Viewpoint or press F6 key. The view is reset to the origin point. Try some low values (e.g. 1, 5 or 10) to speed up the simulation. 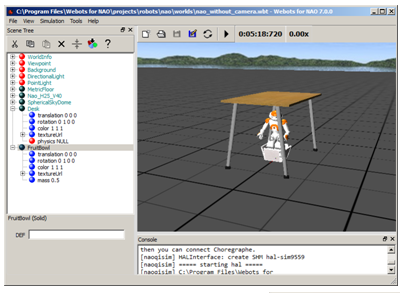 I can’t see my simulated robot in the Choregraphe Browse robots panel. Navigating I lost sight of NAO.